Mrs. Colangelo shows a Becton student the proper way to use the newly purchased equipment. 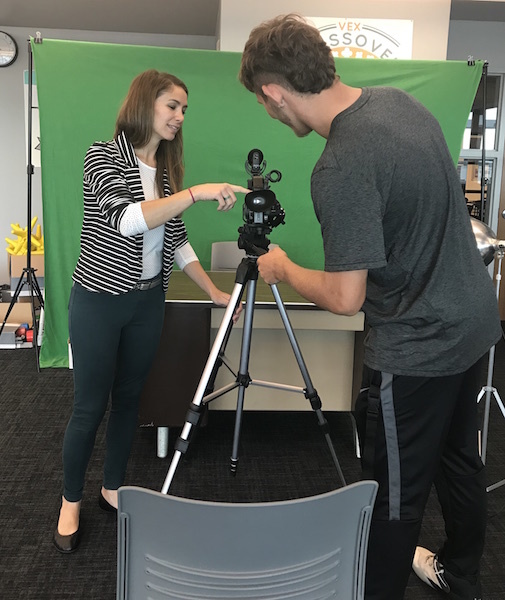 The hands-on class will feature activities that require utilizing the new broadcasting equipment such as a green screen, college-level recording cameras, studio lights and microphones. A main purpose of the course is for Becton students to navigate the different ways to creatively produce television segments and journalistic stories to present to the class or even possibly the rest of the student body and faculty. According to the course instructor, the school currently has plans underway to create a state-of-the-art television studio for students to record in by the winter. “I hope my students learn about the careers and opportunities that exist within the field of television production and broadcasting,” said Mrs. Colangelo. While the class specifically focuses on the broadcasting aspect of media, some components to the course are derived from fellow Becton classes such as Mass Media with Mrs. Settembrino and Journalism, which is taught by Mrs. De Santis. “Journalism is related to TV production and Mass Media highlights all avenues of communication, so TV Broadcasting is designed to implement all that one has learned in Journalism and Mass Media,” the teacher explained. “All these courses work together cohesively to make a successful production.” Students who acquire skills in all three courses are then given the opportunity to put them into practice in her class. Furthermore, Mrs. Colangelo feels that students should take her course because it gives teens a realistic experience in television production and touches upon all the ways to communicate their ideas through visual and audio means. Her advice for her current and future students is that they must be passionate about their work and need to be willing to explore the technology of producing. She suggests that kids with interest in all aspects of television should hone in on their skills, and in addition, be motivated to learn new ones in her class. Mrs. Colangelo’s past experience as a communications major assists her when teaching today. The college courses that prepared her most included the aspect of learning how to direct cameras as well as other broadcasting equipment. Furthermore, she was also employed as a disc jockey for a college radio show, which helps her today with understanding how to use all of the newly purchased audio equipment. Mrs. Colangelo taught at Becton for almost ten years in addition to teaching grades Pre-K through third for one year at Carlstadt Public Schools. Her career began in Point Pleasant Borough High School where she taught a studio art class in 2005. “My hope is that they [TV Broadcasting students] gain enough confidence and experience to be successful in their future endeavors” the teacher expressed. While attending college, Mrs. Colangelo also majored in graphic design, which provided her the skills to teach a new Digital Arts class also offered at Becton.